I'm a film-addict, so I've decided to blog about every film I watch during 2011, good or bad. “No Mr Bond. I expect you to die”. 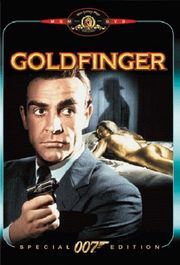 Is there anyone who has not seen Goldfinger? James Bond is ordered to Miami Beach (why doesn’t my job send me there?) to spy on bullion dealer, Auric Goldfinger. Bond notices him cheating at cards and so breaks into his apartment to stop his assistant giving him information. The assistant, Jill Masterson falls for Bond, but she ends up having the most infamous death by being painted from head to toe in gold paint. A classic bank holiday film – it’s cool, sharply written and exciting, whilst not being as preposterous as later Bond movies. This entry was posted in YearInFilm and tagged 1960s, 8/10, action, crime, thriller, tv, uk, usa. Bookmark the permalink.